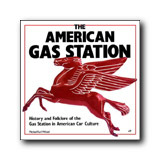 The American Gas Station: History and Folklore of the Gas Station in American Car Culture is the service station book that started it all. Here is the complete history of the roadside refueling station, packed with images of vintage service stations, gasoline pumps, gas pump globes, oil containers, neon signs, petroleum mascots, promotional memorabilia called "petroliana," and more. 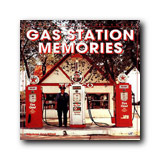 Gas Station Memories takes a fond, fun, photography packed look at the filling stations of yesteryear and the many aspects that made them so memorable. 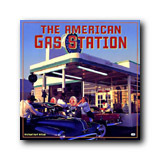 A rich resource of the gas station, including chapters detailing vintage gasoline signs, gasoline pump globes, station attendants, smoking memorabilia, oil cans and containers, gasoline pumps, and promotional giveaways. Remember when filling stations fixed flat tires for just a few bucks? Or when "fill 'er up" meant no more than five dollars' worth of high-octane in the tank? 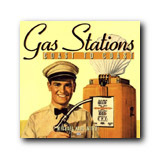 Gas Stations Coast to Coast is a full-service time-machine packed with memories of an age when pulling into a gas station to refuel was more than just a chore, but rather, an enjoyable experience.